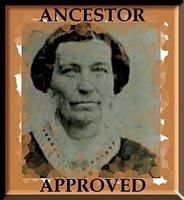 I am delighted and honoured to receive the Ancestor Approved Award from Kim at Footsteps of the Past at http://footstepspast.blogspot.com/. It was a real treat to receive this in an emotional week as I watched from afar as my home town, and others with links to my family’s heritage, were flooded, lives lost, homes demolished and heritage destroyed. Enlightened, surprised and humbled that I was able to find the birthplace of Mary O’Brien from County Clare through meeting up with an elderly lady from Toowoomba who gave me one contact name. This distant relative provided clues and links that let me build a history of this whole clan of the O’Briens from Ballykelly, in Ireland, Australia and the United States. Surprised to find my great-grandfather Melvin was saved from drowning by Thomas Livermore, a blacksmith’s labourer during the Ipswich floods of January 1887. Humbled because if he hadn’t been saved, my line of the family would not exist. Enlightened by finding the church marriage register for my Kunkel-O’Brien gt-gt-grandparents (this will be a blog for Australia Day –a topic suggested by Shelley at Twigs of Yore http://twigsofyore.blogspot.com/-so I won’t elaborate further here). Humbled by the day-to-day courage and commitment of my many Queensland pioneer families as well as “my” Dorfprozelten pioneers. Humbled by the many young men of my families who went to fight for the Empire in France and the Middle East during World War I, World War II, and Korea especially those who lie in foreign graves or whose bodies were never found. Also humbled by the determination with which the families left behind pursued every option to find out more about the men who were killed and sought to get keepsakes for their father-less children. Enlightened to read War Diaries which explained the circumstances surrounding their deaths. Surprised to discover that my great-grandfather married a woman who was a bigamist twice over (at least that’s what the evidence to date indicates and certainly once). Humbled and surprised, but not in a good way, to learn that my great-grandmother Julia Kunkel was operated on without anaesthetic in 1901 because her heart was too weak! Unsurprisingly she died of the childbirth-related illness, and the shock of the surgery. Six weeks later my great-grandfather also died. All their 11 children, aged 21 down to 2, were left orphans (the recently-delivered child appears to have died although not shown in indexes). Enlightened to read a novel which dealt with the horror of puerperal fever. Surprised to discover that the woman who is buried in the Toowoomba cemetery with my great-great grandmother, Ellen Gavin, and her daughter, Julia Kunkel (see above), is not a relation despite sharing the same surname. Why it was so, remains a mystery, except that she had also lived in Dalby in the early days and was estranged from her husband. Enlightened, humbled and delighted to stand on the lands where my ancestors walked in Ireland, Scotland, England and Germany so that I could “feel” their lives and connect to them. Humbled by internet “strangers” going out of their way to show me over their land where my ancestors lived in Argyll in the early 19th century and explain the remains of the small buildings where they had lived. Surprised (more like astonished) to connect with the inheritor of my O’Brien family’s land in Ballykelly and to be shown over the land by Paddy. Enlightened to know oral history meant he knew that they had Mass said in their homes in Australia’s pioneer days. Enlightened to be able to track the transfers of the land through the Griffith Valuation revision books. Humbled to be welcomed by distant family in Ireland. Now for my honour list of 10 other bloggers doing family history proud. I’ve chosen to focus on Australian blogs, some of whose authors have been contributing to family history for many years. I’ve also chosen to bend the rules somewhat and add two web-pages that I think deserve to be here for their extensive contribution to family history research for all researchers…a research Honour Badge. This entry was posted in Awards, Broadford, Dorfprozelten research, Gavin Family Queensland, Irish family history, Kunkel Family History, McCorkindale Family History, Murphy's Creek, O'Brien family and tagged Ancestor Approved Award, Ballykelly, Dalby, Dorfprozelten, Gavin, Ipswich, Kunkel, Livermore, Melvin, o'brien by cassmob. Bookmark the permalink. Thanks so much for the nomination. I am thrilled that you have highlighted Australian blogs in your list. I will put on my thinking cap and try to write 10 surprising, humbling, or enlightening aspects of my research. Wow, you have certainly found a lot of surprises in your research. The combined burial really is an intriguing mystery! I also am very pleased to have been nominated, and will write now of 10 humbling, surprising or enlightening aspects from my family research. I look forward to seeing your 10 aspects. Many thanks for including the Clare County Library website in your honour list. It’s good to know people find the material on the site so useful. You’re very welcome Maureen. I sing the praises of your library to anyone with ancestors in County Clare. If only more Irish libraries were as proactive. You do a great job! Hi Pauleen, thanks for nominating my blog! I don’t usually respond to these things but I’ll do it for you. Wow! what a wonderful research you’ve got here! keep up the good work! very informative. Pauleen, thank you for nominating my blog. I have been away and without Internet access for almost a week, so this was a lovely surprise when I came home last night. I have been preoccupied with family problems, executor duties, helping friends during the floods, etc. Hopefully I will soon find time to write my ‘list of ten’ and pass on the compliment. Hi Pauleen. My lists (ten nominations, and ten aspects of my research) are now in a new blog post. Thanks again for the award. Congratulations. What was the name of the novel which dealt with the horror of puerperal fever. Thank you very much for the nomination! I’m afraid I’m not very good when it comes to responses to these awards… I struggle to think of the ten things and ten blogs (it should be so easy!). However, your nomination has surprised and humbled me and it is greatly appreciated.